Sea turtle steering wheel cover. Small multi color reptiles. Fully lined adorable turtle car accessory. 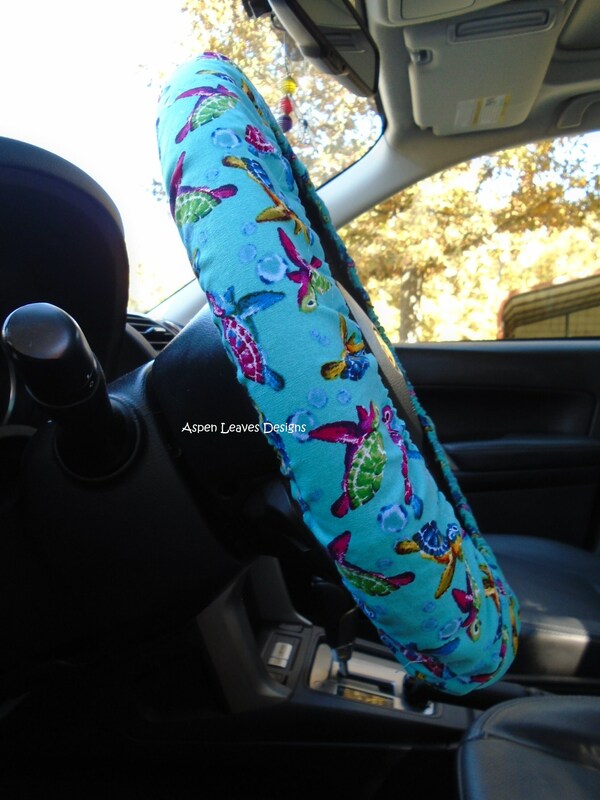 Sea turtle steering wheel cover. Fully lined aquatic reptile car accessory. Light blue and green. Dog selfie steering wheel cover. Fully lined. Lots of dogs car decor. Pet friendly. Hawaiian sea turtle steering wheel cover. Tropical. Fully lined. Colorful hearts steering wheel cover. Multi-color metallic car accessory. Fully lined. 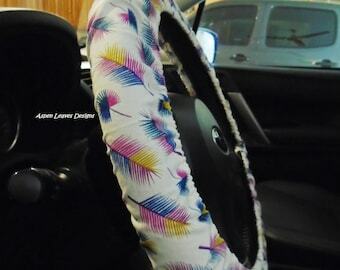 Feather Steering wheel cover. Fully lined colorful car accessory. Checkered steering wheel cover. Black, white, and gray. Fully lined checks car accessory. Orange flaming skulls steering wheel cover. Fully lined. Small pink hearts steering wheel cover. Fully lined. Shades of pink hearts on dark gray fabric. Romantic car accessory. Great grippy bits hidden inside the steering wheel cover. Looks awesome! I LOVE this! Thank you!! Tie Dye steering wheel cover. It's groovy man! Fully lined rainbow, sunburst, hippie car accessory. Amazing steering wheel cover!! Fits perfect! Thank you! I will be buying from you again! Blooming cactus steering wheel cover. Fully lined succulent decor.Ships fast. Peacock feather steering wheel cover. Fully lined pea-bird car accessory. Blue and black. Classic cherry steering wheel cover. Fully lined cherry car accessories. Red on black. Red and blue steering wheel cover. Small bunches of roses. Fully lined floral car accessory. Goldfish Steering wheel cover. Multi color fantail coy. Fully lined. Pet fish car accessory. Royal Blue steering wheel cover. Polka dots. Fully lined blue and white dot car accessory.